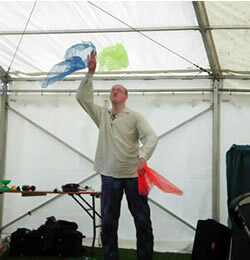 In my Circus Skills Workshops, I teach juggling using 3 scarves instead of balls. Scarfs float slowly through the air, which allows you more time to think of the next throw. 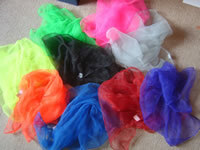 You can learn by Video Tutorial (below), or scroll past it and you can read how to Juggle Scarves – the choice is yours! Once you understand the basic cascade pattern, you can then apply the same 3 step approach below to learn balls, rings and clubs! 1 Scarf Hold the scarf at one corner. Lift your arm as high as you can across your body, and toss the scarf with the palm of your hand facing outwards (like you are waving goodbye to someone)! Reach high up with your other hand and catch the scarf as you bring your hand down (this is called clawing). Now repeat this move and throw back to the first hand! Try to make each throw to the same height (peak). 2 scarf exchange Hold a scarf in each hand. Throw a scarf from your favoured hand. When it reaches its peak (as high as it is going to go), then throw the second scarf. The throws and catches should follow a nice rhythm (throw, throw, catch, catch). Do not throw or catch both scarfs at the same time! Practicing the “exchange” to some music may help you to space out the throws so they all happen in time with the music. Remember to practice starting from your weaker hand also! 3 scarf cascade Two scarfs in your favoured hand (you will need to experiment to find a good way to hold them to be able to make a good clean first throw) and one scarf in your weaker hand. Throw one scarf from your favoured hand, then when it reaches its peak, throw the scarf from your weaker hand. When that scarf reaches its peak, you can throw the third scarf, and then just keep alternating throws between hands! The cascade pattern is an infinity pattern (side on figure eight) so you could go on forever! You can see most of the following tricks described in the video underneath these descriptions. The best of both worlds! Columns Throw one scarf straight up in line with the centre of your body, then when this scarf reaches its peak, throw the other two scarfs (one from each hand) up on either side of the middle scarf. Catch the middle scarf, toss it again, catch the outer scarfs and toss them, and keep going! Under the legs Start your routine by throwing a scarf under your leg. Make sure you can throw it so that it still goes to a decent height and you can continue your pattern. Remember that you can throw with your left hand under each leg, and also with your right hand under each leg, thus giving you 4 different moves! Now try doing these moves while juggling a cascade pattern! Kickup Start your routine with one scarf balanced on your foot, then kick it up into the juggling pattern. Alternatively, at some point in your routine, let the scarf fall onto the foot and you can pause and accept some applause before kicking it back into the pattern! Two in one hand Practice throwing two scarfs in one hand in a clockwise and then anti-clockwise direction. Now practice with your weaker hand! Catch on head Throw a scarf extra high and make sure you can get your head underneath it, and let it gently fall on your head! From this move, you can either let the scarf fall towards a hand to continue juggling, or blow the scarf back into the air and continue! Try landing all 3 on your head in quick succession, or continually switching the scarf colours on your head! Blow Up As the scarf falls towards your hand, blow as much air in its direction. You can blow the scarf out in front of you, or even back up in the air! It helps if the falling scarf is as flat as possible, rather than scrunched up. 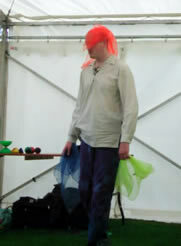 Head-Wipe Show how tiring this scarf juggling is, by throwing a scarf high, then taking time to mop your sweaty forehead with another scarf in your hand! Blanket Throw scarf up as high as you can, then lie down on the floor and let the scarf land on top of you like a blanket! For more tricks, have a look at my Ball Juggling, Ring Juggling & Club Juggling pages.